If you watched last night’s Halloween-themed episode of This Is Us, you saw Randall making a map of the “good houses” before the kids set out for trick-or-treating. Every neighborhood has them. You know, the houses that go all out with their Halloween décor, creating spooky scenes and chilling displays. Not only are they eerily representative of of the spirit of the season, they also, presumably, have better candy – at least according to a certain 11-year-old who is just down the hall from the spot where this is being written, devouring the eight pounds of candy he collected during his two-hour trek through the neighborhood. Halloween decorating has grown exponentially over the past few years, as individual homes (and the errant neighborhood) have taken it upon themselves to scare up an experience that goes well beyond a pumpkin at the door to greet trick-or-treaters. 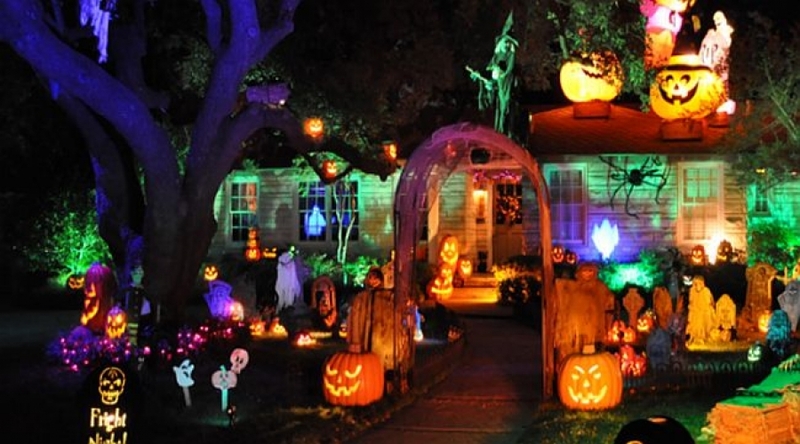 The city of Maricopa holds an annual Halloween home decorating contest called Mysterious Mansion Mayhem, with 25 homes in the mix this year – “the most participants in the event’s 11-year-history, according to Niesha Whitman, the city’s special event and marketing manager,” said azfamily.com. In the California city of Vacaville, residents of Arlene Drive, which transforms into Candy Cane Lane during the holidays, has been increasingly participating in Halloween decorating, as well. “There’s a ‘dark’ side of the Vacaville neighborhood at Halloween,” said the Daily Republic. “Some of the homeowners put some scare in the air with ghosts, goblins, witches and such. Homeowners here prepare for the onslaught of kids with as many as 1,400 pieces of candy. That’s not a huge expense – and certainly not one that compares to the cost or extravagance of preparing a holiday house, especially if you live in a neighborhood that’s known for its elaborate displays. According to the Daily Republic, 80 percent of the neighbors on Arlene Drive, as well as neighboring streets, participate in the holiday decorating tradition. The question of participation is a curious one; those moving into neighborhoods known for these displays have an expectation to go along with the tradition, and stories of intimidation toward those who refused to participate have been floated around over the years. On Milwaukee’s famous Candy Cane Lane, new residents know the deal when they buy, especially since, “A neighborhood committee sends out letters letting everyone know when Candy Cane Lane starts and ends, where meetings are, what to expect and why they do it,” said On Milwaukee. For some, being part of such a storied neighborhood may even be part of the draw. youtubeThe new homeowners found it ‘immediately appealing’ and said that ‘living on Candy Cane Lane is the perfect antidote to the Grinch in all of us'” because it melts away work stress as you drive through the lights. It should be noted, however, that there are those who don’t embrace the work of decorating and the chaos it brings to the neighborhood. “We had a couple people actually put their houses up for sale because they hated it so much,” said one resident to St. Louis magazine. Another downside for those considering moving to a Candy Cane Lane: the cost. Expect to see eye-popping electricity bills with a several-hundred-dollar increase for the months the displays are up. And that’s a conservative estimate; one resident of a California neighborhood has said she has spent as much as $1,800 in December, although annual costs have gone down as homeowners have transitioned to LED displays.